As radiology practices increasingly adopt alternative payment models, radiologists will need reliable practice-related data, including at a broad population level, to inform any practice restructuring, as well as their interactions with key stakeholders. However, such material is not taught in many training programs or otherwise readily accessible to most radiologists. Thus, members of the American College of Radiology’s Young and Early-Career Physician Section (YPS), as they begin to participate in practice-related strategy and decision-making in the early stages of their careers, may benefit from a publicly available source of imaging-related health services information in order to provide useful insights for guiding this process. The Neiman Almanac helps to meet this need. The Neiman Almanac is an open online resource developed by the Harvey L. Neiman Health Policy Institute. The Neiman Institute was formed by the American College of Radiology in 2012 with an aim “to provide credible, objective, and reproducible research to the health policy debate.” Whereas policymakers have traditionally relied on utilization data that is becoming increasingly outdated and misrepresent the current reality, the Neiman Institute seeks to provide updated and more accurate information that relates not only to trends in utilization and costs for imaging services, but also the clinical role and impact of imaging from a quality perspective, so as to better inform health policy decisions. Such information can more clearly indicate the specific value of radiology and radiologists, as alternative payment models grow in popularity. The Neiman Almanac is a unique resource that was developed through the Neiman Institute’s accumulated data resources, analytical methods, and extensive staff efforts. The Almanac presents data from various sources pertaining to imaging services that can be dynamically searched, sorted, and sliced by time period and various state and national filters, as well as viewed interactively, whether as time series plots or as color-coded heat maps. Available information relates to such topics as radiology utilization, cost, access and workforce, including at the individual modality level. Specific examples of data sets include temporal and geographic trends in hospital access to advanced imaging, Medicare spending for imaging by a given modality in the Emergency Department setting, and radiologists’ share of the total physician workforce. Data used to create the Almanac has supported a number of recent publications from the Institute, such as trends in radiology resident and fellow workloads over a 12-year period, the specialty roles and sites of service for interventional radiology procedures, and screening mammography rates in the Medicare population before and after the 2009 U.S. Preventive Services Task Force guideline change. These articles can be accessed through the Neiman Institute’s website. The Neiman Almanac is a powerful tool that radiologists are fortunate to have at their disposal for providing key insights relevant to ongoing policy debates that will greatly influence their future practice. Early-career radiologists are encouraged to access the Almanac, view the tutorial, browse the available data sets, and identify areas of interest and relevance to their work. It may also be useful to check back occasionally, as the site is expanded and more data sets are incorporated. It is hoped that the Almanac’s content will be valuable for YPS members in navigating the imaging-related health services landscape, as well as promote an enhanced understanding of key trends relevant to ongoing practice and payment model restructuring in radiology. 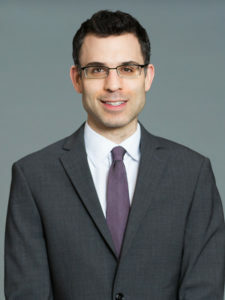 Andrew Rosenkrantz, MD, MPA, is the Health Policy Liaison and a member of the Executive Committee of the ACR’s Young and Early-Career Physician Section. He is also an Affiliate Research Fellow of the Harvey L. Neiman Health Policy Institute as well as an Associate Professor of Radiology and Urology, and Director of Prostate Imaging, at NYU Langone Medical Center. Follow him on Twitter @arosenkrantzmd.